Our product range includes a wide range of bunk bed and metal bunk bed. We have huge collection of Wrought Iron Beds. These beds are made of elegant and long-lasting metals. 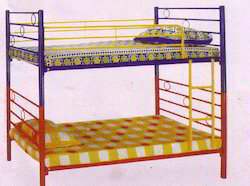 Made of superior quality wrought iron and with superior powder coated finish Wrought iron beds manufactured to order are as per choice of design & size.